Contact Us : 403-519-8200 Email is best. Note: Email is best way to place your order or inquiries. Simply provide your name, phone number and address along with your request and we will contact you quickly. Our palletized BC Birch firewood is the finest quality birch firewood available in Alberta. Less ashy than white birch, longer burn time and higher BTU value. This is prime hardwood firewood. We GUARANTEE our wood is ready to burn, NO guessing involved and we deliver it promptly to your home or business generally next day or within 48 hours. Moisture tested at a consistent 16 to 20 % - consider prime and ideally dry for optimum burning. ALL PIECES HAND SELECTED , TIGHT STACKED, BUNDLED AND PALLETIZED. Our Canada Firewood 1.3 cubic metre size pallet works out to 45-50 cu ft , this slightly more than a face cord, but just under a half a cord of tight stacked wood bundles, just a few cubic feet less (5-10% or so less )..but that's a tight stacked measure, not a guess. its reasonably close to a half cord "guesstimated" measurement, especially if you've been buying loose cord wood. Most often loose half cord is actually about a third of cord (42 cu ft) give our take a bit when stacked up. We try to be as clear and transparent as possible that we do NOT sell our firewood in "cord" measurements we use cu ft and cu metres as per the world standard. 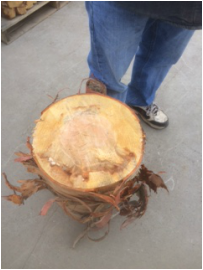 note on prices : Firewood is a commodity item and prices can fluctuate with little notice . be warned prices can change regardless of the prices posted on this website. it is our policy to confirm prices at time of order if any changes have occurred. NOTE : Due to the BC fire situation last year and again this summer as well as the extreme high demand from the US building boom have created some serious shortages of Raw wood , specific firewoods like Birch and Larch are limited. At least 4 Calgary and 1-2 other firewood resellers have closed down due to the shortage of firewood and other market factors exacerbating the supply chain has caused an abnormally high demand in Calgary , Canmore/Banff and surrounding areas . Please be patient and allow us to have the time to contact you, we are being bombarded with inquiries and calls. we will do our best to supply you with something as it arrives. 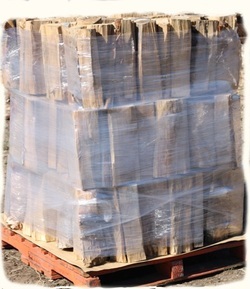 $390.00 for 1 pallet (Approx 1.3M3) 48 bundle. small delivery surcharge applies to areas outside of city limits. This is very good long burning firewood with high heat value, low ash. most popular firewood in BC where people use it for heating . Perfectly dry, hand selected shorter length pieces . We have this product for those that desire a high heat hardwood for longer burn times. This is superb long burning and high heat value, dense firewood . People that know and use Larch firewood prefer it to almost everything else. It has burn time and BTU value very close to Yellow Birch, however it burns differently . 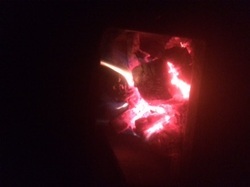 Larch burns hot and eventually when it coals it produces super long lasting radiant embers that throw heat for a long time after the fire has died down. It seems to consume almost all of its ash . Birch produces a lot more ash and covers and smothers its own coals unlike Larch. Larch does not pop a lot of embers like Pine or Spruce which is very desirable, however be aware that it will pop some. Note : if Larch is not avialble consider Douglas Fir as a viable substitute. DF burns very similar and has close to the same heat value and burn time. Larch is often very hard to get firewood as it is not a commonly avialble commercial variety . We have brought in these Crated Douglas Fir chunk and slabs as an option for those looking for economical yet good quality firewood for fire pits, wood stoves , boilers etc. This wood is suitable for many fireplaces as well, These slabs and pieces are a recycled secondary product from a structural timber mill. the wood is seasoned and ready to burn. We have tested this firewood and its provides a very nice hot fire with longer burn time than Pine or spruce firewood. Some of the pieces may be large ( wide) and require some simple splitting, however due to the shape and straight grain of fir it is very easy to do . These savings are possible based on the delivery cost when buying multiple pallets. Each crate is exactly a Third of a cord in exterior size and wood tight stacked inside. Order a chopping block with your firewood Order - Only $55 ! This hand crafted in Alberta Kindling Maker works slick and fast. You can make a pile of perfect kindling in minutes with this foolproof device. 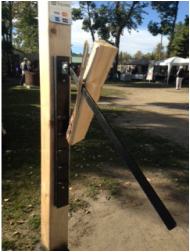 Tough, rugged and made to last , this device will produce large amounts of kindling without the use of a hatchet or axe. very safe and easy to use. Simply ask for your Kindling maker to be sent with your firewood order or request one by mail. Wet frozen piles on top of dirt or gravel. You can buy your firewood from suppliers that store their wood in outdoor piles on dirt or gravel, where the wood absorbs water from rain or snow sitting on it for months. All the while the wood in the middle or on the bottom of the pile maybe wet and mouldering and collecting insects waiting to arrive into your home or garage. When you get a pile of this wood dumped on your driveway along with a lot of bark, splinters, sawdust, gravel and dirt , does that make you happy ? Why buy our Palletized birch firewood ? When you buy our Palletized Firewood, it is clean because it's been hand picked while stacking the pallets, this leaves most of the the bark, dirt and rocks out of the wood and back at our yard and not yours... Our wood is not stored in large piles outdoors exposed to rain and snow (and collecting bugs), Our firewood is stacked neatly on pallets and covered, where it ages and seasons properly. Plus the customer can always tell they're getting the correct consistent measure they paid for because you can see that the wood is tight stacked and the measurement can be checked. 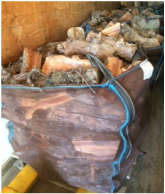 If you have bought firewood at a garden centre or bulk gravel outlet, the workers use short cuts like "8 loader buckets are a cord" or the "The delivery truck box half full is a cord " , This is not the way to get a fair measurement, but is common practice. Often these people doing this could care less if it's even close, they are concerned with what's easy for themselves. Some places in Calgary sell their wood by weight, that's very risky as firewood like poorly seasoned birch can weigh 30% to 40% more than dry seasoned birch. You will pay more for lower quality ! This how they sell gravel and sand (weight in /weight out) and weighing the wood is easy for them, but bad for you. Cord measures make very little sense in this day and age and no two firewood retailers will use a consistent amount each time, its different every day and with every different person loading the wood. it pretty much a guess every time. Even if the supplier stacks the wood, the different sized lengths and shapes means a different amount each time so even that is not an assurance of quantity. If the wood, especially birch is not properly seasoned a exact tight stacked cord at 25 to 30% moisture (commonly sold as seasoned) will shrink about 20% to 30 % in Alberta's dry winter climate. so now the "full cord" is actually a third of a cord in volume. "Guesstimating" a cord measurement by a firewood reseller can leave you with 25-30% less wood than you thought you had bought and paid for. Shopping or calling around to all the firewood resellers with the assumption that their cord is the same as the last guys cord in order to save a few dollars can be a waste of time if the measurements are not accurate and in our opinion, this is more common than it should be in Alberta. Getting a "cord" of firewood for $50.00 to $100 less in savings can be negated because you actually got less firewood PLUS you also buy a load of bark and dirt along with it. With loose bulk firewood I can pretty much guarantee you that they are NOT actually measuring each load of wood by making a 4x4x8 stack, they are guessing it. The loose wood is always a lot less than the stacked wood. How can you compare prices when every place in town is doing something different. With a pallet you can see the actual stack and each pallet is consistently sized. Firewood sold in larger mesh bulk bags and bulk tote bags will be less than a quarter cord no matter what they tell you. These bags are standardized at a maximum size of 27 cu feet when filled with a fine grained product like sand or grain, however loose firewood does not fill the spaces up so it likely to be at least 25% less than quarter cord. The wood on our pallets are tight stacked, so there are not gaps and spaces like loose wood. We do not sell our pallets by the cord measure, the dimensions do not equate properly to cord amounts. Our Canada Firewood 1.3 cubic metre size pallet works out to 48 -55 cu ft , this is more than a face cord, but just under a half a cord of tight stacked wood, just a few cubic feet less (5-10% or so less )..but that's a tight stacked measure, not a guess. its the closest thing to the half cord measurement, especially if you've been buying loose cord wood. Most often loose half cord is actually about a third of cord (42 cu ft) give our take a bit when stacked up. In Europe where all firewood is sold by the m3, the equivalent to a "cord" is 3 cu metres (3M3), which is very close to a cord in actual volume. 5 %to 10% less is much better than 25 to 30% less if you are comparing prices per cord measure with other vendors selling loose firewood. You will get almost exactly the right amount or more on each of our consistently sized pallets simply because we require the pieces to be a lot more accurate in order to build a stable pallet.